SUPERMARKET giant Tesco has launched an appeal after the city council refused plans for a new store in Oxford. It wants to build a new Express Store on the site of the boarded-up Friar pub in Old Marston Road, Marston. But in September, Oxford City Council’s north east area committee dismissed the proposal over concerns about traffic and parking. And councillors questioned whether the area needed another supermarket. Mick Haines, who led the campaign against the store last time, said: “I am shocked that Tesco have come back again. I honestly thought they would give up this time. Mr Haines gathered more than 800 signatures against the Tesco store earlier this year. It was the second time Tesco had been turned down, after previous plans were refused in April 2009. Mr Haines said: “It is just not something people want here and I thought we had made that clear. Tesco has recently opened new stores in Magdalen Street and St Aldate’s and is also planning a shop on the site of the boarded-up Fox and Hounds pub in Abingdon Road. The appeal for the Marston site is now being considered and a decision will be made by December 12. Tesco spokesman Michael Kissman said the firm’s Tesco Express store would create about 20 jobs. He said: “We have lodged an appeal as part of the democratic planning process and that will allow all the issues to be looked at in detail. He added: “We believe when we open stores we bring more people back to High Streets and communities to shop. “It’s understandable that people have questions about changes in their community, but when we open we have seen an increase in trade not just for us but often for other businesses near us as well. ANTI-TESCO campaigners are urging the supermarket to drop a plan to build a store in Marston, Oxford, after the scheme was rejected by city councillors. The supermarket wanted to build an Express store on the site of the boarded-up Friar pub, above, in Marston Road. But Oxford City Council’s north east area committee dismissed the proposal over concerns about traffic and parking – and questioned whether the area needed another supermarket. The supermarket had previous plans for the site turned down in April 2009. Campaigner Mick Haines said: “I think it is brilliant decision. 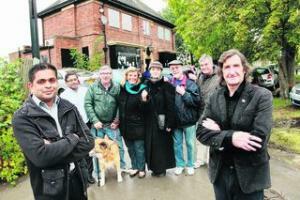 Residents cheered as councillors threw out plans to demolish a derelict pub in Old Marston. Oxford City Council’s north east area committee met on Thursday last week to consider a planning application by Tesco. Councillors rejected the proposal, raising a number of concerns about traffic safety, loss of trees and what would happen to existing shops. The store giant wanted to turn the derelict Friar pub on Old Marston Road into a Tesco Express. The meeting was attended by around 40 residents who opposed the plans. Mick Haines, 64, of Croft Road, Marston, said: “We need to support our local shops and businesses because they have been there for a long time. Mr Haines presented a petition against the Tesco plan, which had 1457 signatures. 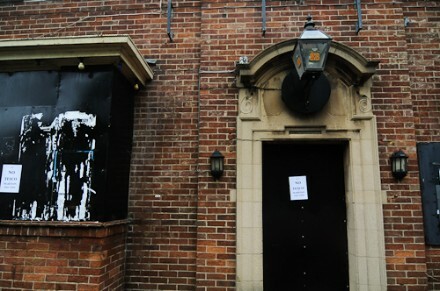 Tesco had previously submitted an application to develop the pub, which was refused by councillors in April last year. The store had come back with an application to demolish the pub and build a two-storey store with nine car parking spaces. Councillors at the meeting voiced their concerns over the effect building the store would have on the area. After hearing arguments from both sides, councillors voted unanimously to refuse the application. Melanie Chiswell, Tesco corporate affairs manager, said: “It is always interesting to listen to what the community has to say. “It is disappointing that we are not able to invest into a derelict site and bring some life into the area. Malcolm Everton, 64, from Old Marston, said: “It is a fantastic outcome. “I have fought for the elderly and disabled for many years and the shops that we have here are a massive lifeline for them. PASSENGERS are calling on double deckers to be introduced on a popular city route to stop passengers being left stranded at bus stops. 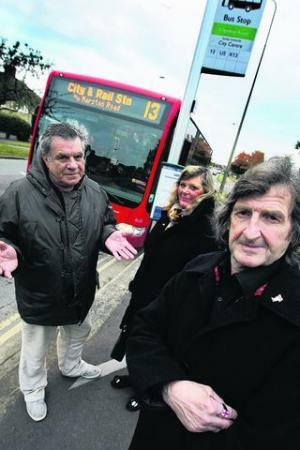 Bus users living in Marston conducted a survey which showed eight number 13 buses, running from the John Radliffe Hospital to Oxford train station, were too full to pick up passengers over 13 days. They also complained that passengers were squeezed on like sardines with standing room only if the buses were not too full to stop at the Marston Court bus stop. Jo Bartlett, of William Street in Marston, who conducted the survey said: “The route is absolutely chock-a-block. At least once a week people can’t get on the bus. “The buses are full, there’s too many students and they can’t get all their luggage on. “It’s very annoying and frustrating. Oxford Bus Company’s route 13 runs every 20 minutes during peak hours, via Northway and Oxford High Street. The X13 dovetails with the service to offer passengers a bus every 10 minutes if they are travelling into the city centre, but it does not serve the station. Mick Haines, 70, of Croft Road said: “It’s very bad. I have seen people squashed like sardines on the bus and a lot of people say to me it definitely needs a double decker. Mr Haines is concerned the situation could become impossible for residents as a block of flats for 371 students is set to open on the corner of Marston Road and John Garne Way next year. OxfordBus Company operations director Louisa Weeks said: “We are aware that occasional journeys at the busiest times are full on a small part of the route. We know how frustrating that can be for passengers but it’s also really frustrating for us. “There’s no pattern or rhyme or reason to indicate when the buses are likely to be full, it seems to happen on average on one journey a week, at different times, in the morning rush hour. “We are carefully monitoring the situation. “We will be reviewing the whole of the service once the next phase of Transform Oxford is in place and resources are freed up. I NOTE that there is a city council by-election for the Barton and Sandhills seat vacated by former Liberal Democrat councillor Patrick Murray. I hope that the people of Barton, in particular, several hundred of whom supported my fight to save the Headington subway, remember that the Labour Party did nothing to prevent it being filled in. In its by-election leaflets Labour claims to be “on your side and standing up for your area”. What rubbish. They weren’t on the side of and didn’t stand up for the people of the Headington area on this vital issue. In fact, they cannot be trusted. 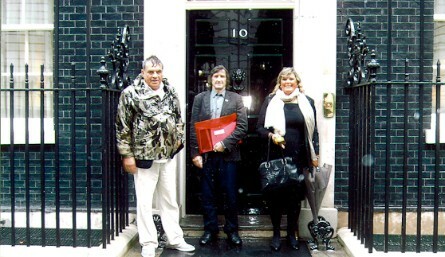 A frustrated Oxford campaigner went to 10 Downing Street to present a petition to David Cameron to force action. Mick Haines, of Croft Road, Marston, travelled to London on Thursday, September 23 to give a petition with 1,205 names beside it. Mr Haines’ petition is fighting to get lights installed in Croft Road Park, Marston. The petition, titled ‘Lighting needed for Croft Road Recreation’, has been the brain child of the 69-year-old campaigner for the last three years. Mr Haines told the Oxford Journal that he started the campaign in 2007 when he originally collected 670 signatures. Since then he has presented it to Oxford County Council, who he says have failed to deliver lights to the park. This year he decided to revamp the campaign and collected a further 570 signatures. He travelled to the capital with his campaign manager, Jo Bartlett of William Street, and fellow campaigner John Townsend of Croft Road. Mr Haines, a retired scaffolder, who stood in Oxfordshire County Council elections in 2009 as an independent for Headington and Marston, said: “The petition is a way to try and get the council to force their hand. Marston has been a forgotten area for too long and we have been put back down the agenda for too long. “You have cyclists who go to work in the morning through the park but have to go out of their way for the journey back because the park is too dark to go on through. “It is a brilliant feeling when you walk up to the door the Prime Minister, you know then that you have got to the top man personally. Currently, Croft Road Recreation Ground has marked areas for sports, pathways for walkers which are frequently used by cyclists but no lights. Councillor for Headington and Marston, Roy Darke, said that the issue is something that the County Council are looking at, but a legal issue with the area had halted development plans. Cllr Darke said that the County Council has a scheme that will regenerate the recreation area, but a lengthy legal process to claim the land along Purcell Road, which currently has no ownership, has delayed developments. He added that he hopes to have some lighting covering the recreation area by next year.